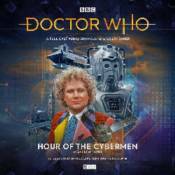 Starring Colin Baker as the sixth Doctor. Answering a call from UNIT, the Doctor arrives in London to find the streets deserted, apart from looters in possession of a valuable commodity - water. Britain is suffering an extreme and bizarre drought. The cause is suspected to be extra-terrestrial. The discovery of a signal being transmitted into space, and of a spacecraft whose crew are desiccated corpses, provides a possible answer. But the true enemy is an old foe of the Doctor's. The Cybermen have been patient, setting their plans in place over a number of years. As the final stage is implemented, in the darkest hour, the Doctor must identify who among his allies he can trust.